CCC’s student-run newspaper just keeps racking up the awards! 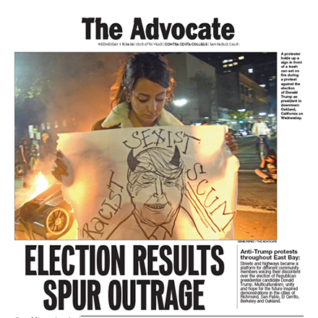 Last month, The Advocate Editorial Board attended the College Media Association/Associated Collegiate Press (CMA/ACP) National College Media Convention in Dallas, Texas, where they won a prestigious National Newspaper Pacemaker Award (for the 16th time,) and were named the Two-Year Best College Media Outlet of the Year. The Advocate staff also brought home awards for News Page / Spread, Photo Page / Spread, Arts & Entertainment Story, Multimedia Photo Story and Entertainment Page. Only days before that, paper was bestowed a whopping 32 honors at The Journalism Association of Community Colleges (JACC) Northern California Convention, including General Excellence Awards for both the online and print editions! In all, twelve CCC students left the event with awards. You can find out more about The Advocate and CCC’s journalism program right here.